Share this with your friends who love music, or stories – and especially stories with music. Share it with anyone you know who’s had a dream that seems to be taking forever to come to true – because sometimes it takes a lot longer than you think. This is a story told ‘from the Harp’ in music and words about my 20-year journey to reinvent the 75-lb classical concert harp so I could wear on stage. It’s about how a bicycle inspired the technology of an instrument — and it’s about the visionary French harp builders who took my dream and made it a reality – for a whole new generation of musicians. 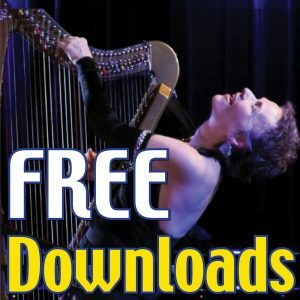 The three videos in this section will give you a sense of the harp, the woman who plays it, and the collaboration that made it possible. The factory-video was taken at the CAMAC harp factory in the countryside of Brittany, in France. You’ll see the machine that cuts out the harp shape, the computer design, the men who create the finish and the tiny pickups that get a huge sound out of the instrument. It can get noisy in the factory when you’re building harps – but don’t worry, we pulled down the noise and added subtitles when it got too loud.